Before I sneak off to SHOT Show next week, I will be starting the spring semester at Wake Forest University. 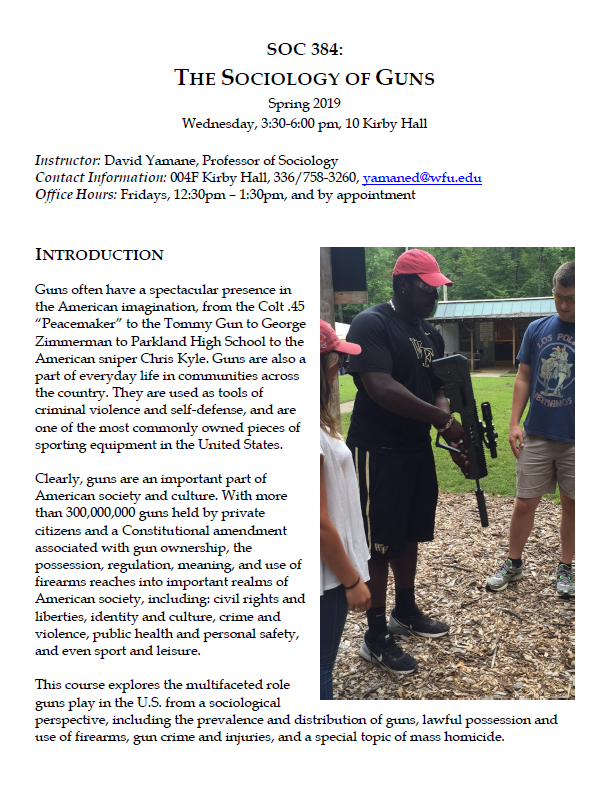 As I have for the past four academic years, I will be teaching my Sociology of Guns seminar. A copy of this year’s syllabus is available HERE. One modification I made in Version 5.0 was to add more guest speakers. The line-up this year includes John Johnston of Citizens Defense Research and Ballistic Radio on gun training, Craig Douglas of Shivworks on self-defense, Rob Pincus of Second Amendment Organization on suicide, Randy Miyan of Liberal Gun Owners on gun politics, and a representative to be named later from one of North Carolina’s gun control organizations. Although I always modify the syllabus to some extent (more sometimes, less others), one constant has been the class field trip to the range. 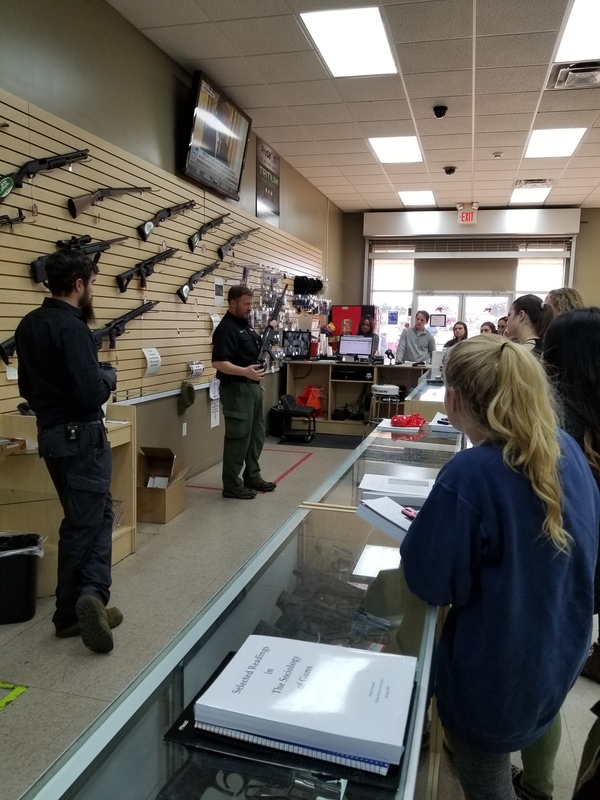 The trip has two components: a safety and information talk by someone from the range, and giving the students the opportunity (but not requiring them) to shoot. 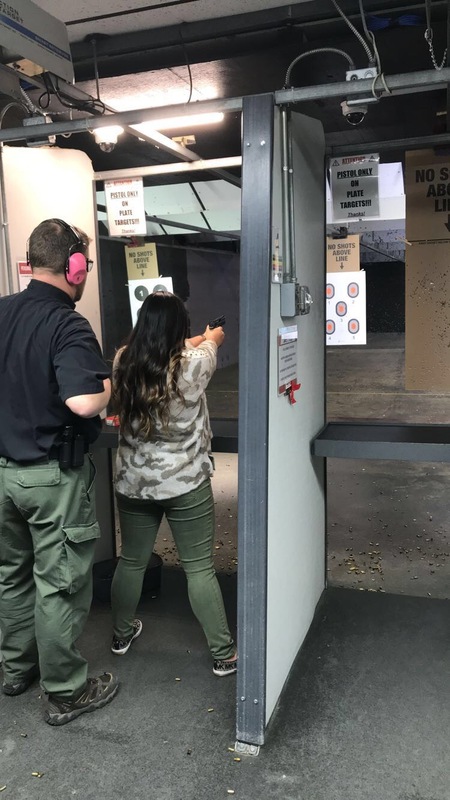 Sociology of Guns student shooting at Proshots Range, January 2018. When possible, I do this on the first day of class to create a foundation of knowledge, experience, and camaraderie that carries through the class. 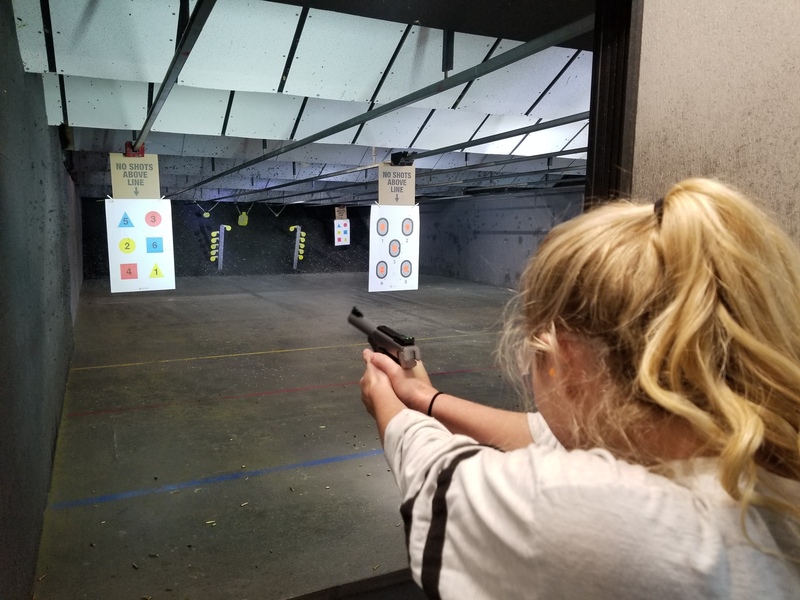 When I teach this course in the spring, we visit our local indoor range, Proshots Range, which is a great, Gun Culture 2.0 and new shooter friendly place. I am looking forward to having manager Richard Talbert and his staff host us there again this year. Tags: ProShots Range, Richard Talbert, Sociology of Guns, Wake Forest University. Bookmark the permalink. What? You didn’t invite a guest speaker from the Board of Directors of the Los Alamos Sportsman’s Club? sniff….sniff…whimper…. I’ll have to time my next visit to see brother Rich in Durham to one of your lectures. Yeah, and how about the important perspective of those freezing in.. I mean _from_, the non-contiguous states? When will you be in NC? I looked at the suicide study. I’m not sure that they actually accounted for demographic differences (particularly indigenous populations as drivers) nor the seriousness of suicide attempts, versus raw number, as well as they think (but, my stat game is weak). Also, might be useful to the class. DOJ just updated their “Where do felons get their guns” survey. That gives us pre/post Brady from the ’90s, one in ’04 (IIRC), the recent Chicago Jail survey of a couple years ago, and now the new DOJ. Part of my approach to the suicide issue is to address the methodological challenge of connecting guns to suicide. So I picked the one article to that end and fill in some other related materials in class. It’s doubtful that the students know either of these two by reputation, but I hope that by the end of the course they appreciate what Douglas and Johnston have to offer the academic study of guns. Stay tuned for reports on that.